With a plethora of parks and play places, kids and families in Goshen have no shortage of options for ways to get outside and get moving. 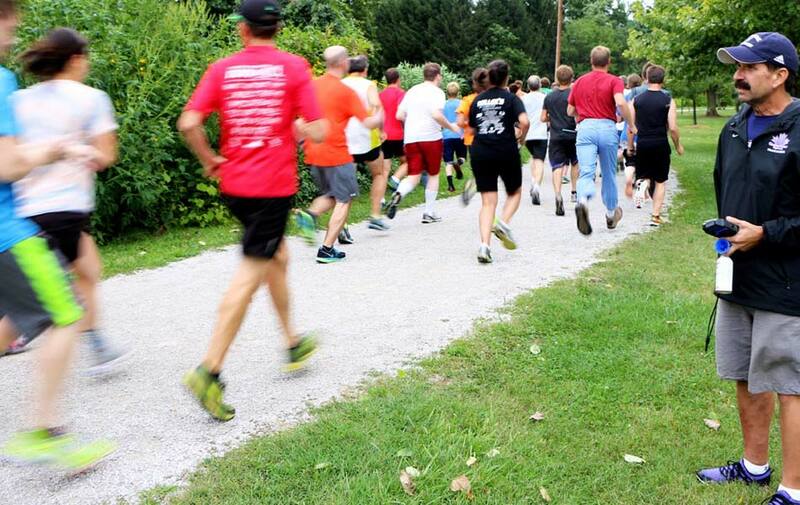 Goshen’s many parks are brimming with fun and fitness opportunities. Ox Bow Park includes volleyball courts, horseshoe pits, playgrounds, a bike trail, athletic fields, and an 18-hole disc golf course. During the wintertime, it has trails for cross-country skiing and two sledding hills. During our windy Indiana springs, don’t miss the high-flying kites above the park and their determined pilots on the ground! Ox Bow is also home to educational programs in which children can learn about wildlife, animal habitats, wetlands, and much more. The 14-acre Pringle Park includes sandlots for volleyball and soccer fields. Pringle Park also features a crushed-stone perimeter path ideal for walking, running, and bicycling. Named for the Maple City’s last mayor, Allan J. Kauffman Park includes an interactive art and music play area, a hill slide, lookout towers, open play spaces, a climbing wall, and trails. In 2015, the Indiana Park and Recreation Association honored the park with its award for exceptional park design. Shanklin Park has a community pool for cooling off during the summertime. It’s also a popular spot for lap swimmers. For kids who prefer to stay dry, Shanklin’s Tommy’s Kids Castle is a playground with room to romp. Kids and adults alike can stay fit at Goshen’s 100-acre Fidler Park Pond. The park features a bike/pedestrian trail, along with canoe, kayak, and pedal boat rentals. Feeling competitive? Have a boat race and paddle or pedal your way across the pond. First one to the other side wins! Goshen College offers a variety of summer athletic camps for kids. The camps are designed to sharpen children’s sports skills, and also instill a sense of teamwork and the importance of being physically active. Is your child enthusiastic about soccer, volleyball, and/or basketball? Committed coaches at GC teach the fundamentals and make sure kids have fun at the same time. The Elkhart County 4-H Fair is a community tradition that draws tens of thousands of visitors every summer to the fairgrounds just east of Goshen. The annual festival features rides, concerts, 4-H exhibits, and much more. “Wait a minute,” you say. “Don’t they sell fried dough there?” Well, yes. However, the fair has opportunities for physical fitness, too. For one thing, walking the fairgrounds to see all there is to see is great exercise. There’s also Kids’ Day. Held the Wednesday of fair week in Heritage Park, the event includes activities for kids including a Big Bouncy Ball Race, a Giant Inflatable Wheel Race, and a Watermelon Roll. After all that exercise, it’s probably OK to have a little fried dough. 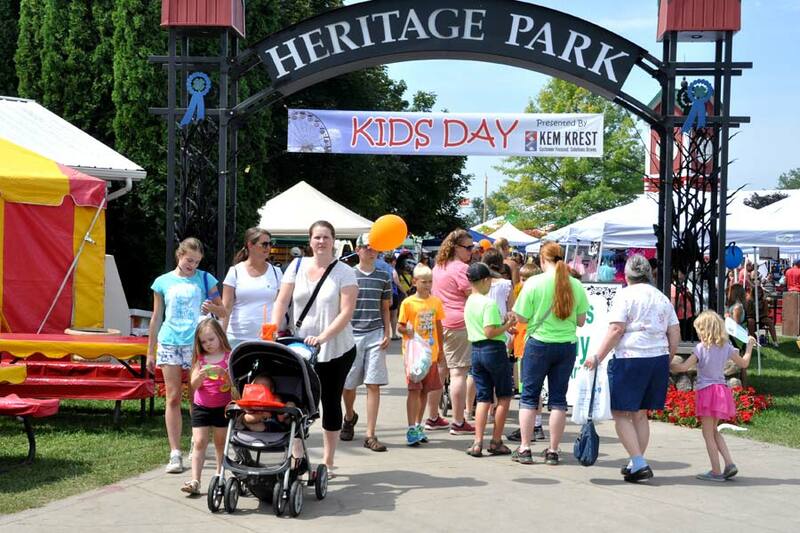 Families enter the Elkhart County 4-H Fair for Kids’ Day. 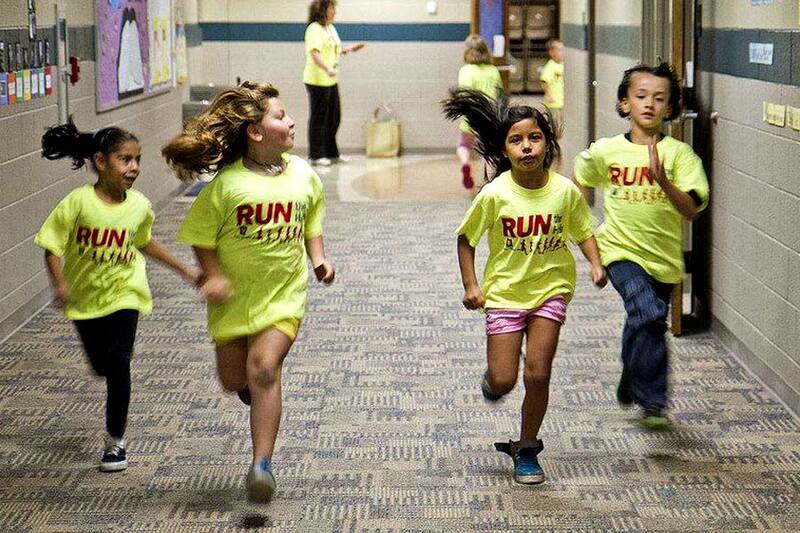 Goshen Health promotes “Run the Halls” events in nearly 30 local schools as part of its Community Wellness and Education (CWE) program. Run the Halls is designed to get children running, hopping, jumping, and just being active. You can read about how much fun Waterford Elementary Schools students have with the program here. So run in the halls, kids! Well, sometimes. There’s riding a bike, and then there’s riding a bike with pizzazz. 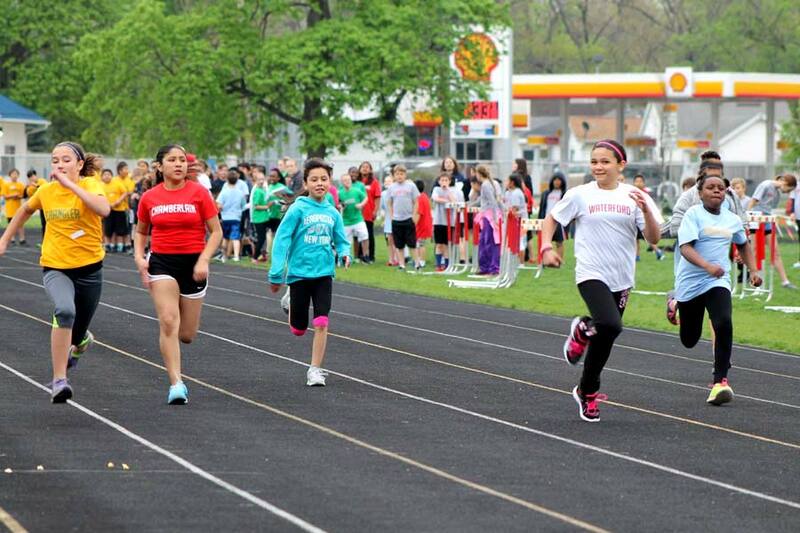 Kids can do exactly that – and enjoy some exercise at the same time – during Get Up and GOshen. Sponsored by Goshen Health, Get Up and GOshen takes place every June at Shanklin Park. It features a bike ride, as well as a bicycle obstacle course that makes cycling fun AND challenging! The event also includes games, interactive learning stations, and other activities. 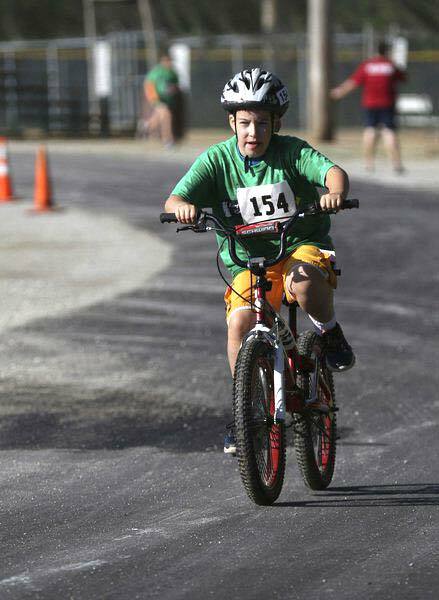 Students compete in the Goshen Kids + Teens Triathlon. 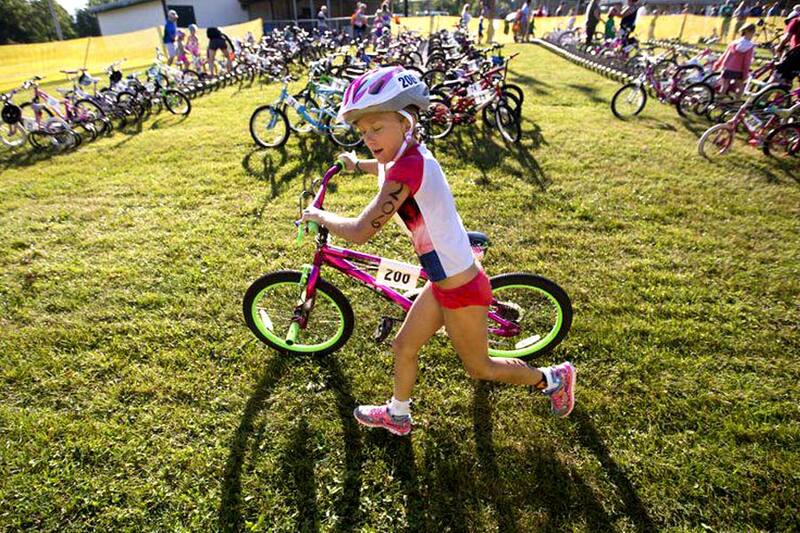 Students compete in the Goshen Kids and Teens Triathlon. Every year, young people try their best at the Kerry’s Kids Kids’ and Teens’ Triathlon at Shanklin Park. Competitors begin with a swimming contest before progressing to a bike route and a run. Adults can get in on the fun, too! Parents are invited to participate with their children during the run portion of the triathlon. The triathlon is open to anyone ages 5 to 18. And while most of the athletes are from the Goshen area, the 2017 event drew more than 300 participants from 24 different cities and towns. 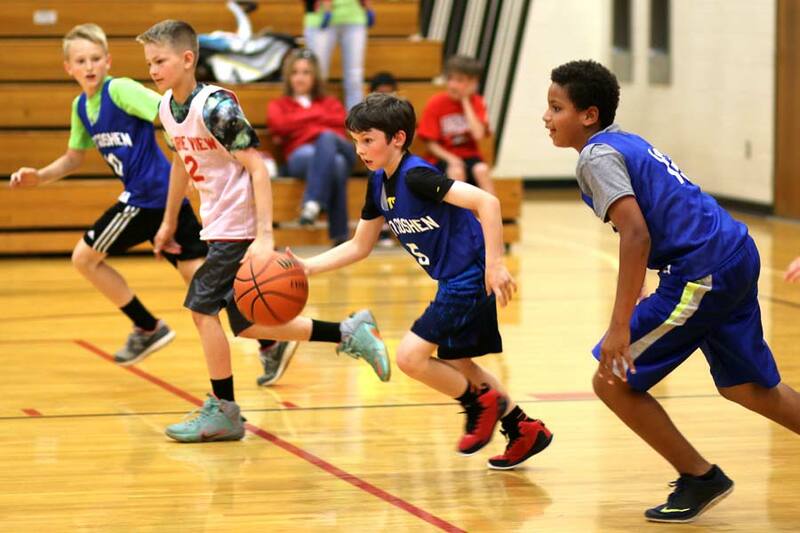 Goshen students also learn sports fundamentals through Goshen Community Schools’ elementary sports programs, and they learn from great teachers. In addition to paid coaches, the program utilizes community volunteers and high school- through college-aged athletes. Almost every high school sport has an elementary coordinator, except for sports that have a well-established community youth program, such as Little League baseball and softball.